Small and robust, ergonomic and intuitive, economic and powerful - the Drager Pac 7000 is tailor-made for personal monitoring at the workplace. This innovative single gas detector is equipped with a wide range of functions and is suitable for many different applications in day-to-day industrial settings. The detector is an impressive instrument, offering a high level of reliability and rapid warning against harmful concentrations of CO, CO2, Cl2, HCN, H2S, NH3, NO2, O2, PH3, SO2. With its compact, handy, pocket-sized design, Drager Pac 7000 is tailor-made for personal monitoring in daily work activities. 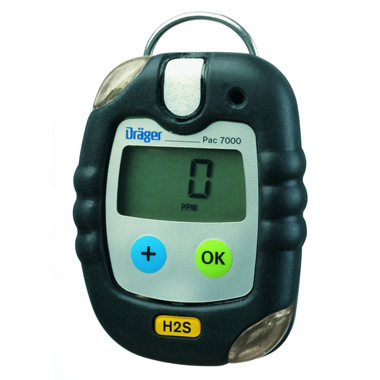 Drager Pac 7000 was specially designed as a small and robust instrument to meet work requirements. The impact-resistant housing features a protective rubber coating and is resistant to corrosive chemicals. Drager Pac 7000 meets the requirements of IP 65. What is more, protection against electromagnetic effects was specially optimized, while a stable and tightly locking crocodile clip made of stainless steel allows the instrument to be fastened securely to the wearer's clothing. To allow for individual preferences, the crocodile clip can be turned and the two alarm lights are positioned diagonally opposite at the corners of the instrument. Easy battery and sensor replacement are key factors to ensure a long instrument life. The concentration display uses no written text (to avoid language problems), showing all information in the form of large numerals or symbols. In case of an alarm, or at the push of a button, the display can be backlit for better readability. The currently measured concentration is displayed continuously, as are notice and warning functions. In addition, the respective peak concentration, average concentration (TWA value) and short-term exposure limit (STEL) relating to the measurement period can be accessed. New sensor technology "en miniature"
Drager Pac 7000 boasts the latest in sensor technology. The small size of the sensor supports the application-oriented design of the instrument. Any gas hazards that may occur are displayed immediately thanks to the very short diffusion paths inside the instrument and the extremely quick electrochemical reaction times achieved by the new sensors. The sensor is positioned inside the housing such as to allow gas to reach it from above and from in front. This positioning minimizes the danger of the gas inlet opening being accidentally covered. In conjunction with a vibration alarm, a visual and audible alarm is triggered if the two adjustable alarm thresholds are exceeded (or if oxygen levels fall below the set value). For optimum perception a two-tone alarm is used. Furthermore, Drager Pac 7000 features an adjustable TWA alarm and STEL alarm. A warning is likewise given at the end of the battery capacity or in the event of a device error. The safety of personnel must always have the first priority. Their safety depends on measurement and warning equipment functioning perfectly, which is why national regulations demand regular testing of equipment function using a known gas concentration. Drager Pac 7000 is equipped with a bump test mode. When a bump test (function test or challenge test) needs to be performed, a notice icon appears on the screen. The bump test interval can be set by the user. The result of the bump test is saved in the instrument's memory. Drager Bump Test Station is available for easy performance of the bump test. Drager Pac 7000 features a menu from which the bump test mode, fresh air calibration and span calibration can be selected. Access to fresh air and span calibration can be password-protected. The instrument is equipped with an IR interface and can be linked to a PC via the connecting cradle or E-Cal system. Drager Pac Vision or Drager CC Vision software installed on the PC enables configuration of all functions, as well as calibration and download of the stored data. In addition, the instrument allows an individual operating time to be set (in days), e.g. a calibration interval, inspection interval or individual operating time end. Drager Pac 7000 features a data logger in which all concentrations and events are stored together with their respective dates and times. The intervals at which peak concentrations are saved are variable and can be adjusted by the user. If a one-minute interval is set, the data logger has a capacity of about five days. The stored data can be downloaded via a PC and the installed Drager Pac Vision or Drager CC Vision software and edited using, for example, Microsoft EXCEL software or Drager GasVision software.